If you could ride just one lift for the rest of your life? 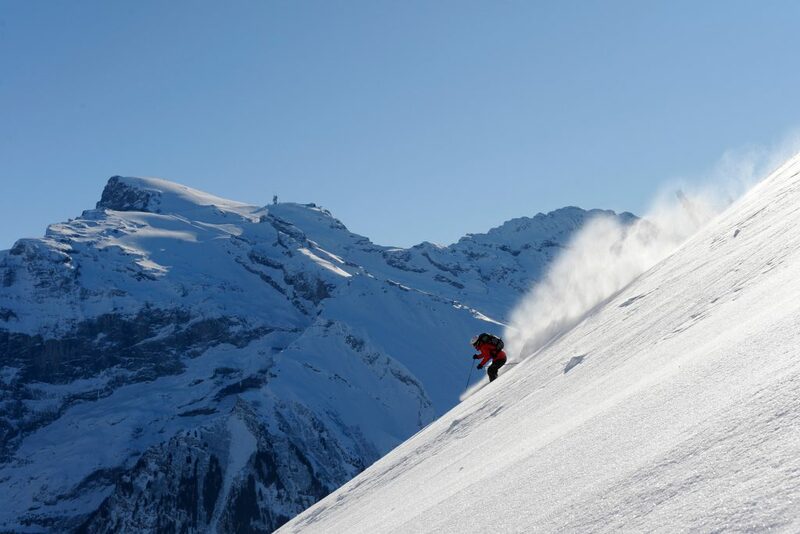 …Fall-Line Backcountry Editor Martin Chester on Titlis Rotair Gondola Engelberg, Switzerland. More than just an emotional roller coaster up Love Mountain, this is a lift to compete with the very best for easy-access freeride terrain. 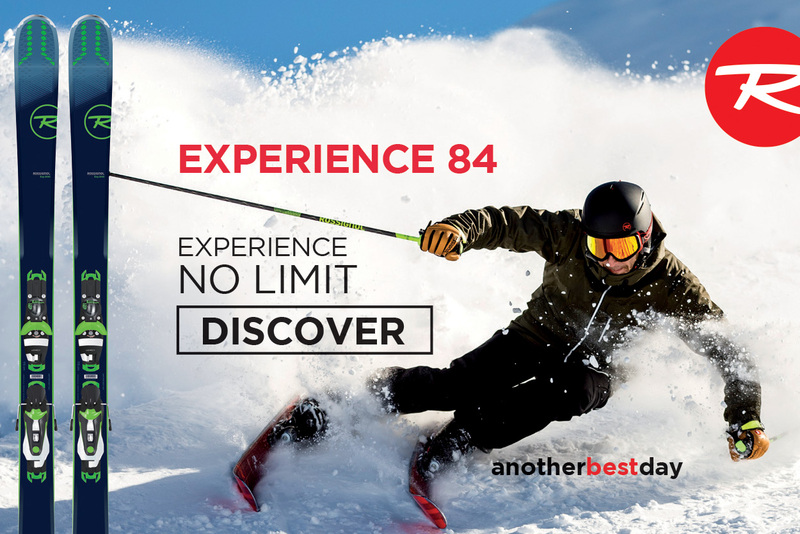 I have a penchant for those resorts with one great big mother of a lift, that give access to acres of freeride terrain (and maybe the odd day tour for when things get really tracked). 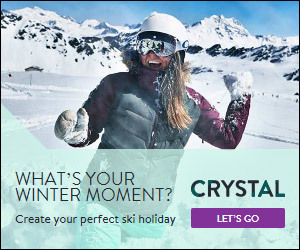 Sure, the list includes legendary lifts like the Gemsstock in Andermatt and the bubbles at La Grave… and Engelberg’s Titlis Rotair was high on that list by reputation before I’d even been. The most important feature of all those über-lifts is the way they make you feel. This is every bit as important (or maybe a consequence of) the terrain they provide access to. So my first visit to Engelberg felt like a pilgrimage. This was the last of the ‘big lifts’ on my tick-list and the Rotair Gondola is the veritable jewel in the crown of this mighty resort. I was not the only pilgrim on my first ride. Be prepared to share this bin with Bollywood wannabees, making their own personal pilgrimage to Love Mountain (as Titlis is portrayed) from all over India. It adds a certain wacky spice to the proceedings long before you put your skis down on the snow. Shuffling into the bin, hopes and dreams mingle with nerves and excitement. It revolves 360° during the five-minute trip, and with ever-expanding views of the various lines through the Steinberg glacier, it’s not only the rotation that makes you feel giddy. While your fellow passengers will be clamouring for a glimpse of Love Mountain, you’ll be treated to a fly-over of the entry routes, conditions and current lines to help you choose your next run. The lift is whisking you up to 3028m, and you would not believe so much awesome terrain could be so visible and readily accessible from a single lift. Stepping out of the final elevator, look north from the top of the resort and you’ll feel as though you’re on the edge of the Alps: the flat plains of northern Switzerland and Germany disappear before you. Look south over the mighty south wall of Titlis (600m of precipitous limestone) and you’ll feel like you’re on the edge of the world. Click and a kick and a skate and a schuss, and you’re leaving the pilgrims behind on your way to more awesome terrain than you can handle. On your first visit, schuss across towards the Gletscherlift Rotegg and turn left down the obvious off-piste variations to the mid-station at Stand: steep as you like and quick as you want. For those familiar with the terrain (and carrying the right kit for glacial adventures) the Steinberg awaits. Check out the lines from the bin on the way back up, and turn off the ice-flyer red run to gain a short steep entry into glacial heaven. The best routes vary with the season and conditions; the snow stays coldest over on skier’s left in the aptly-named ‘never sun’ area. Take the correct kit and take the glacier seriously – it is full of crevasses. Within the vast bowls of this resort, the terrain is best described as ‘dramatic’. Go cautiously as you find your feet as, with numerous cliff bands, it’s not guaranteed to work out okay when route-finding at speed! Finally, once you’ve built your confidence and familiarity, you may be ready to tackle the biggest hidden gems of them all. The Laub is an iconic run, possible to access directly from the Rotair lift, but best if you throw in a lap on the Laubersgrat lift to quickly access the traverse. Sneaking over the ridge and rolling over the edge, a uniform 1000m of pleasure awaits – and all between 30-40°! But the best of the bunch is the awe-inspiring Galtiberg descent. This is the real thing, with over 2000m of vertical descent and a must-make traverse. And while it never gets out of hand, it never disappoints, as the gradient stays good from top to bottom. Getting the line wrong is not an option. 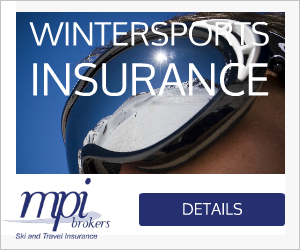 So ski with a local or a guide and be sure to take the right equipment (and mindset). If that doesn’t make you feel nervous with trepidation, you probably shouldn’t go there. If you do, your legs will be screaming for mercy before your mind will be screaming for more. The result will be deep feelings of psyche and satisfaction that will last for days. 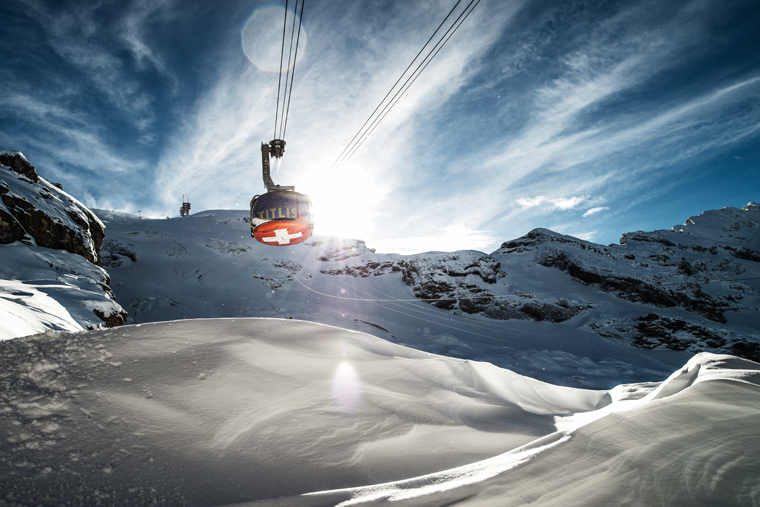 Or until the next dump… In the meantime, it’s off for a quick après-ski beer at the Engelberg Ski Lodge. Cheers!